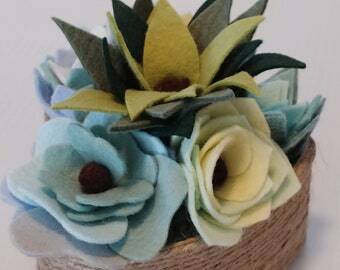 This indoor wool felt flower garden measures 6" x 6" and features a small pebble and seashell floor topped with handmade wool felt flowers that will bring a lovely touch of color inside. The base is a wooden box hand-wrapped with natural jute twine in a deep orange. 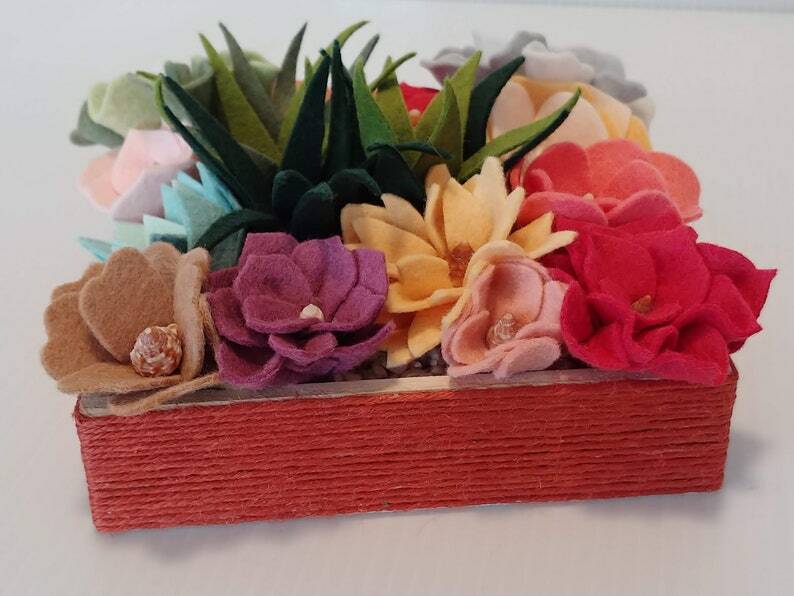 This beautiful handmade wool felt flower garden is perfect sitting on a shelf, table, counter, or desk and would make the perfect gift for a housewarming, Easter, Mother's Day, the hostess, a wedding, bridesmaids, a birthday, your boss or a co-worker, and anyone who just loves flowers but doesn't have a green thumb! 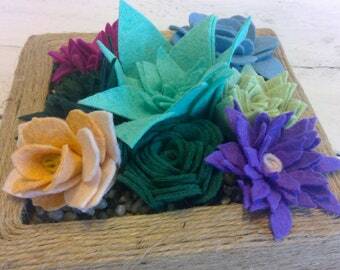 This adorable handmade wool felt gardens would also be lovely as a wall hanging. All CoasterDoodles products created with wool felt are handmade (no machines are ever used for cutting or assembly) with love in my smoke-free home. Felt decor items are not intended for outdoor use. I'm happy to discuss custom orders with you but please remember this will take extra time depending on materials available, how many gardens you order, and the time it takes to create them as every garden is hand wrapped and each flower is hand cut and assembled. April showers bring FREE SHIPPING! Now thru April 30th. it is absolutely beautiful I plan on buying the tallest one.. This is SO cute!!! I’m in LOVE!!! Incredibly quick shipping time. Adorable well-made coasters! Can’t wait for Thanksgiving (because who waits until Christmas to set out their decorations?!) thank you Pam!! The sweetest little custom felt succulent pot and thank you note. Great craftsmanship, beautiful vase, and amazing customer service! Thank you Pam! Sizes depend on the items you order and are listed within the item descriptions. If you still have a question, please feel free to ask! Custom and personalized orders take more time to process. Once the item is made, for example, the coasters must be coated which is a 3 day process itself. Please feel free to ask if you are not sure. That being said, I do accept custom orders on select items and do my best to match colors and design requests. Please remember colors can look different on different computers/monitors. Any name, individual letter or initials, word, etc. 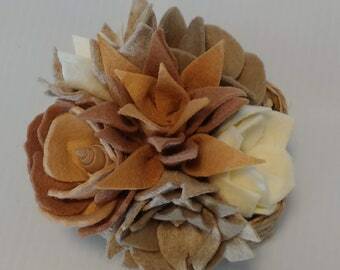 can be made with the jute or yarn wrap. The sets you see are samples. If you'd like something else just ask and we'll work together. Just remember, custom orders take more time and depend on availability of materials needed to complete. Please note that once your purchase is in the hands of the USPS I have NO CONTROL over delivery times. I ship in a timely manner but I have no control how long it takes a package to arrive. I DO NOT REFUND for delivery delays due to the USPS. Thank you for understanding. CoasterDoodles reserves the right to reproduce custom made items and to photograph all items created by CoasterDoodles to be used at our discretion for advertising or as samples in the listings. All photos are the property of CoasterDoodles and cannot be used without express permission from CoasterDoodles. If your purchase is damaged when you open it, you MUST SHOW PROOF. If you are dissatisfied you will be refunded upon receipt of returned purchase. Simply put, there will be no refunds without the return of purchase. Buyer is responsible for shipping cost of return purchase.